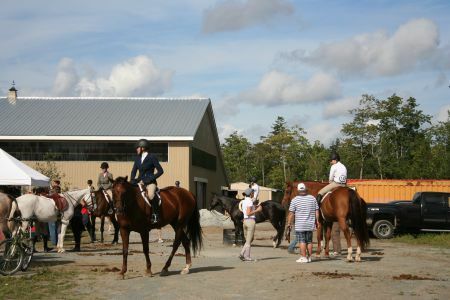 KJIPUKTUK (HALIFAX) – A large commercial equestrian farm has members of the African Nova Scotian community of Lucasville upset. Residents who live around the commercial recreational farm say they can't open their windows, let alone sit on their porches, because of the strong smell of manure. The Lucasville Community Association knows that it is in for a fight. They want Memento Farms to leave the community. Just how long and how intense a fight became clear at last week's meeting of the North West Community Council. That meeting included an opportunity for residents to explain their concerns to local councillors. Rather than simply listen to residents' issues, councillors Brad Johns and Tim Outhit turned the meeting into something that at times felt more like a skirmish. Right off the bat Brian Murray, a member of the North West Community Planning Advisory found himself challenged by councillor Johns. “On your farm you have cattle and chickens, is that correct?” Johns asked of Murray, who works a farm that has been in his family for generations, and that is miles away from the Lucasville community. ”And how many cattle would that be,” Johns continued his interrogation. “It's such an interesting strategy you have come up with, all of you,” said a visibly upset councillor Tim Outhit, after hearing speaker after speaker complain about the farm and question the city's commitment to uphold its own regulations. “We want to help you. We explained the process, and you come in and insult us,” Outhit said to shouts of derision from the Lucasville attendants. For Lucasville residents, the issues with Memento Farms are merely the latest example in an ongoing history of neglect by city bureaucrats and councilors. Matters are made worse because the farm, which arrived in the community 13 years ago, is operating without the proper permits. Zoning for the area doesn't allow commercial recreational enterprises. It also appears that not all buildings were approved. It's that discovery that triggered the current development agreement process that has Lucasville up in arms. “We as a community feel that the integrity of our cultural and historical identity has been slowly eroding over the last decades, in large part due to municipal developments and decisions that have not taken into account our cultural identity,” said Susan Wells, speaking for the Lucasville Community Association. “If many of these instances community members were not consulted of even made aware and fully understanding of such developments or decisions until after the fact,” Wells said. Community activist Lynn Jones also attended the meeting. She is associated with the Enrich Project, a group that researches and mobilizes around examples of environmental racism in Nova Scotia. It's not just the smell of the farm that has people upset. Rodents, manure runoffs, increased traffic and noise are other issues that make the lives of Lucasville residents miserable. For the residents the current fight is merely the latest battle in their larger effort to preserve the historic community, resisting what is in a sense the rural equivalent of urban gentrification. Many of the residents fighting Memento Farms are African Nova Scotians who have lived there for many generations. They are joined in their battle by more recent arrivals, including residents of the new subdivisions that have been established over the last decades. A petition to disallow Memento Farms continued existence is reportedly receiving huge support. A Public Information Meeting, still to be scheduled, will provide the next opportunity for the community to have its voice heard. A video of the North West Community Council meeting is posted here.